Fans of Grey Gardens (1975), Albert and David Maysles’s cult favourite documentary on the isolated life of mother and daughter “Big Edie” and “Little Edie” Beale in their run-down East Hampton mansion, will fondly remember the young handyman Jerry Torre—the Beales’s only regular visitor—nicknamed the Marble Faun by Little Edie. 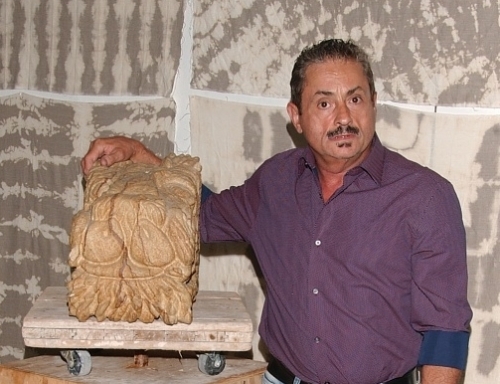 Fittingly, Torre went on to learn stone carving and is now an artist, whose work is currently on show at the New York gallery Geary Contemporary in the exhibition Charles Andresen and Jerry the Marble Faun (until 3 February). The show brings together Andresen’s paintings, made of scoops of acrylic thrown on canvas, and glazed terracotta sculptures by the Marble Faun, an echo of swirling forms.